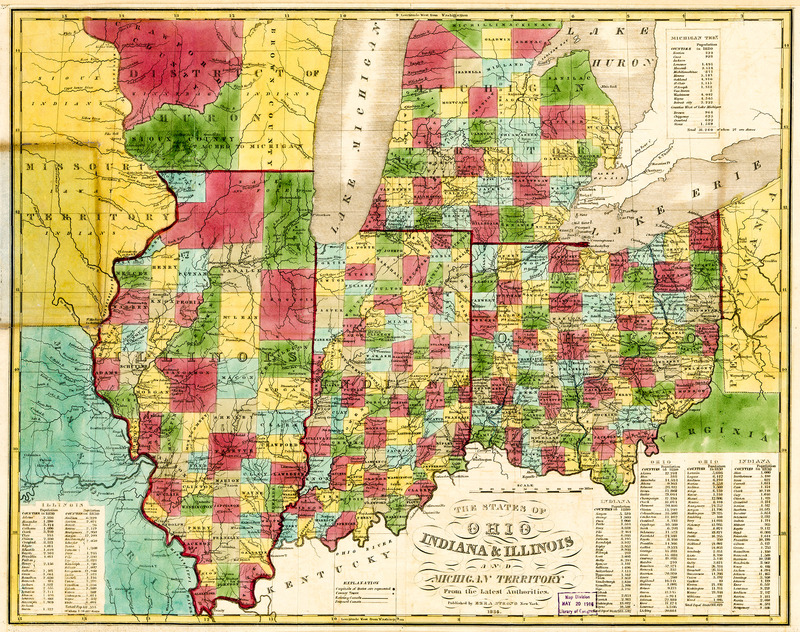 Prior to statehood in 1816, the land that would become the State of Indiana was part of the Northwest Territory, along with what is now Illinois, Wisconsin, the eastern part of Minnesota, and the western half of Michigan. The landscape was largely forested at the time. Seeking a suitable site for a capital city, in 1820 a state legislature-appointed committee secured a plat of dense forest near the confluence of the White River and Fall Creek, based on three criteria: a central location, fertile land, and access to a navigable river. Alexander Ralston, the surveyor and engineer who had previously worked with Pierre L’Enfant on his Baroque-inspired grand plan for Washington, D.C., was hired to design the layout of the new city. Inspired by his work with L’Enfant, Ralston created what came to be known as the Mile Square plan, consisting of a central circle with four radiating avenues bisecting a grid of streets. The 300-square-foot circle, sited atop a rounded hill of sugar maples, was allocated for the Governor’s House (now Monument Circle), while other plots were reserved for the State House, Court House, two markets, and three religious institutions. In similar fashion to the nation’s capital, significant streets were named after states, including the four radial arteries: Massachusetts, Virginia, Kentucky, and Indiana Avenues. Cognizant of the site’s topography, Ralston designed two angled streets to parallel Pogue's Run creek where it met the grid in the southeast portion of the city, a departure from the otherwise symmetric plan. Provisions for open space were not a priority in Ralston’s plan, as the surrounding wilderness was no more than a half-mile from any point in the city. However, incidental public green space developed within the sets of triangles created by the angular avenue interruptions to the rectilinear street grid. By the 1820s, residential lots were being sold in the northern and eastern sections of the Mile Square, as it was desirable to be as far away from the swamps and lowlands of the White River, Fall Creek, and Pogues Run areas as possible. The Northside earned a reputation as the fashionable, residential neighborhood, while the riverfront was consigned to more than a century of commercial operations and working-class housing. This early shift away from the river resulted in the addition of the first streets beyond the Mile Square, as people ventured further north. In 1826 the National Road, the first major federally-funded highway in the United States, was extended to connect from the East Coast through to Indiana, linking with Washington Street, the primary commercial artery of the new city. Construction of the road was completed within a few years and provided an economic boost to the growing, yet still mostly isolated, city. By the mid-1830s Indianapolis was a major stopping point for traffic moving west on the National Road. Plans for a central canal that would further increase connectivity within and beyond the state fell short during the depression of 1837, and only an eight-mile stretch was ever constructed. However, railroads succeeded where the canal failed. The first train connected Madison, Indiana, on the Ohio River, with Indianapolis in 1847, the same year the city received its formal charter. 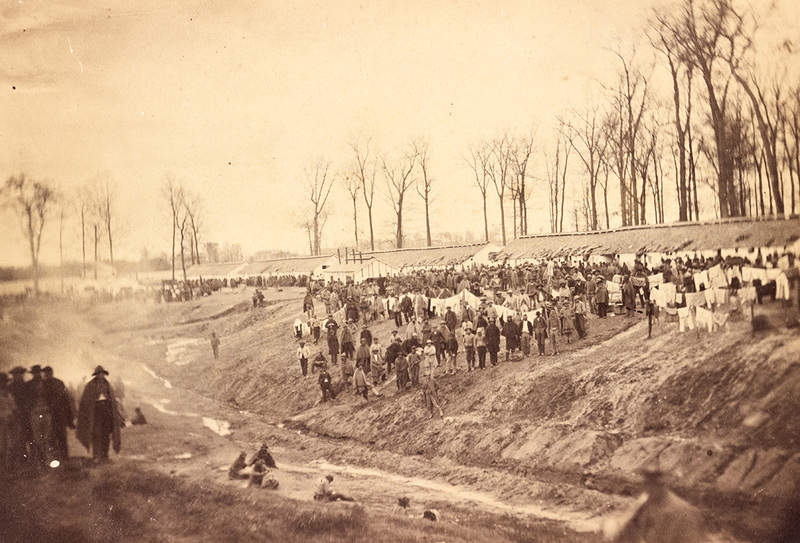 By 1870 eleven railroads led into Indianapolis, making the city an important military staging ground during the Civil War. This was a period of expansion for the city, and land was added outside of the original plat for military grounds and a cemetery. Some of the city’s first dedicated public spaces, including Military Park and University Park, became recreational areas after they were no longer needed as Civil War training grounds. The turn of the century saw the advent of the streetcar and the automobile, and both technologies would have a profound impact on Indianapolis. “Streetcar suburbs,” such as the Riverside Drive neighborhood, were constructed as the population increased and people sought residence further beyond the confines of the Mile Square. The provision of public transportation also enabled the development of larger, suburban parks, including Brookside and Riverside Parks. Meanwhile, automobile entrepreneurs were making their fortunes, and key players, including Carl Fisher, Frank Wheeler, and James Allison, built their country estates in these new neighborhoods, bringing famed landscape architects, including Jens Jensen, to complete projects in the city. The entrepreneurs also co-founded the Indianapolis Motor Speedway at this time. In 1912 prominent businessman Hugh Landon constructed his American Country Place estate, Oldfields, now part of the Indianapolis Museum of Art and a National Historic Landmark, with its landscape designed by Percival Gallagher of Olmsted Brothers along a then-remote section of the White River. At the end of the nineteenth century, Indianapolis city leaders recognized the need to respond to the health, transportation, and housing issues caused by rapid job growth and industrialization. 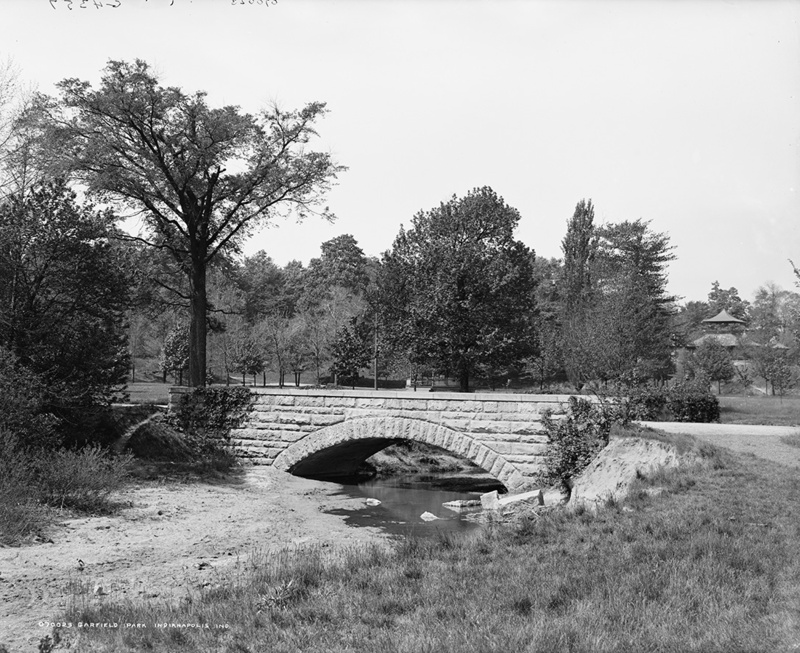 Inspired by the City Beautiful movement, in 1894 the Commercial Club (predecessor to the Indianapolis Chamber of Commerce) hired Joseph Earnshaw, a landscape engineer from Cincinnati, Ohio, to develop a comprehensive park system. Earnshaw identified two waterways, White River and Fall Creek, as the most important natural features for consideration in park planning. Earnshaw's recommendations proved too expensive for the Commercial Club to implement, however, and they instead established the Indianapolis Board of Park Commissioners to oversee the project and enlisted John Charles Olmsted as a consultant. By 1907 the project had stalled with only a small segment constructed. Led by the new board president, respected physician Dr. Henry Jameson, the Park Board set out to form a plan to finally develop the park system they had envisioned for two decades. Their search led them to landscape architect and planner George Kessler, who had completed successful park systems in many other Midwestern cities, including Kansas City and Denver. He submitted the Indianapolis Park and Boulevard System Plan within the year. Kessler focused on a three-tiered system. The first element of his plan was the large tracts of park land on the city’s borders that featured both undeveloped natural areas and planned landscapes. These larger parks included Garfield Park on the city’s south side, Riverside Park to the north, and Brookside Park to the east. Smaller parks scattered throughout each neighborhood made up the second feature of Kessler’s plan, and the winding parkways linking the system together provided the final tier to his design. The plan’s greatest achievement was the comprehensiveness and interconnectivity of its design. Kessler united individual parks and curvilinear parkways with an array of east-west and north-south boulevards, linking the city to a network of transportation and recreation corridors that also functioned to conserve the natural environment and guide urban growth. Naturally vegetated open space, playgrounds, playfields, and strolling paths provided recreational and social opportunities, while Beaux-Arts bridges afforded access points across the city’s streams and rivers, and earthen dams and levees were designed to mitigate flooding. Ambitious in scope, Kessler’s comprehensive system was never fully realized. 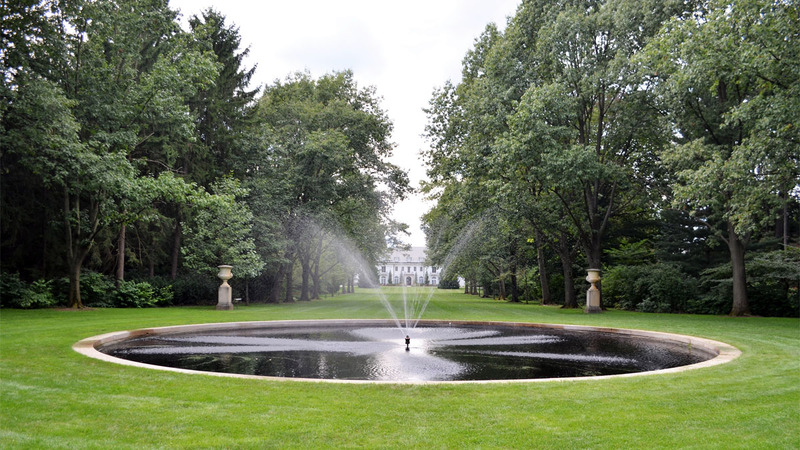 Upon his unexpected death in 1923, landscape architect Lawrence Sheridan was hired to continue the project. Yet by 1944, only 34 miles of parkway (out of the planned 175) had been constructed. The majority of these parkways that exist today have been expanded to four- or five-lane roads, and now serve as major traffic arteries for the city. With these lane expansions, much of the planned green space along the stream banks has been replaced with pavement. Although the park system faces challenges today, including proper stewardship of its historic roads and bridges, its significance and value is reflected in the 2003 listing of its more than 2,150 acres in the National Register of Historic Places – one of the largest such designations in the United States. The late twentieth and early twenty-first century has been a period of revitalization for the city of Indianapolis. In 1994 its first Greenways Master Plan was implemented, seeking to expand the parkway system beyond Kessler’s original vision into new sections of the city. There are now over 60 miles of trails in an extended network, nearly doubling the original infrastructure constructed during Kessler and Sheridan’s time. The addition of new bike lanes to existing routes, and the construction of the Monon and Cultural Trails, which afford direct connections to downtown, have been critical in providing the means for city residents to more easily access public open space. The development of the Indianapolis Cultural Trail, from 2008 to 2013, also refocused attention on the revitalization of downtown, which retains its original Mile Square layout to this day. Happily, there has also been a recent resurgence of neighborhood development, with residents moving back into older neighborhoods. Sites such as White River State Park and the Indianapolis Canal Walk emphasize the city’s post-industrial regeneration efforts, while referencing its historic connections to the river and canal. Comprising the southern quarter of the Mile Square, the Wholesale District, an area that suffered from urban blight, has also seen rejuvenation in recent years. The Cummins Indianapolis Distribution Headquarters, Julia M. Carson Transit Center, Indiana Convention Center, and other prominent public spaces situated within the Wholesale District (listed in the National Register of Historic Places in 1983), represent an exciting revitalization, making visible the city’s historic and cultural history, while illustrating the role that landscape architects play in shaping the public realm in the twenty-first century.